Before last week, Seward County freshman Angelina Minor’s career high in kills was 9 and she was struggling to find her way into the lineup on a Lady Saints team loaded with hitters at her position. Fast forward seven days in a week in which she recorded her two best performances of her collegiate career with 22 and 19 kills, she was named the NJCAA National Player of the Week on Wednesday in a national release. Minor had a monster week for the Lady Saints, averaging 4.56 kills and 1.22 digs per set in a pair of Seward matches. Tuesday against Pratt she hammered down a career high 22 kills, hitting .341 in the match and blowing away her previous best mark of 12 kills. She proved it wasn’t a fluke on Thursday as she rattled off 19 more kills in a Seward win over Cloud County to give her 41 kills on the week, equaling her previous 12 matches combined. 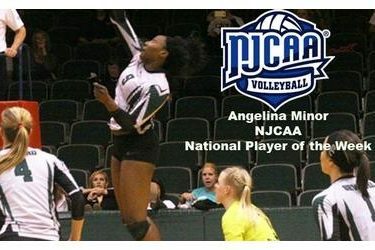 Minor becomes the first Lady Saint to be named NJCAA National Player of the Week since Thayna Silva during the 2012 season. Minor and the Lady Saints open up Region VI Tournament play on Sunday night in Hutchinson when they take on Butler at 5:00 in the 1st round of the tournament.